I am over at SewMamaSew today with a pattern I designed for this Baby Butterfly. 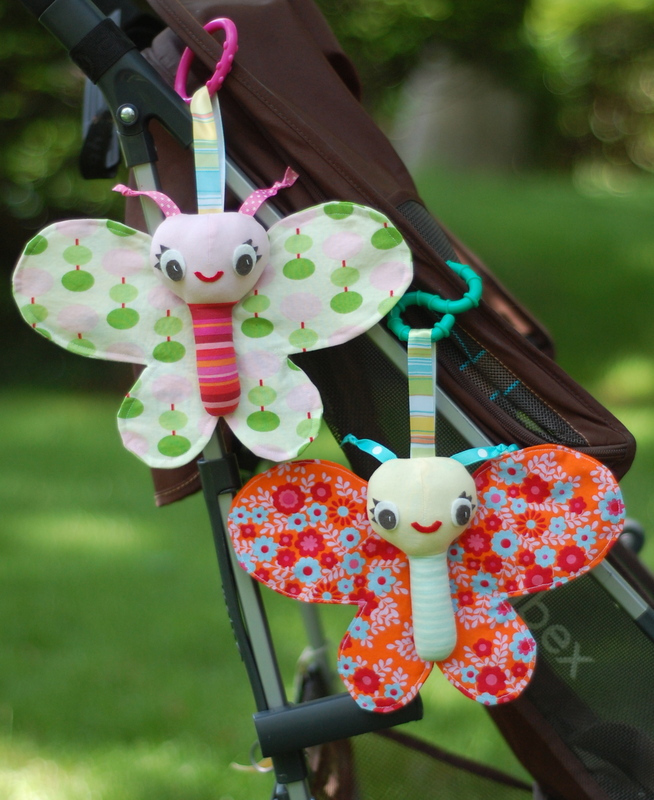 This butterfly is made to be a stroller toy (or you could attach it to your diaper bag) to entertain your baby when your out and about. Long line at the coffee shop? Stuck in traffic? Give the butterfly a little shake and hear him rattle (there is a jingle bell sewn into a little muslin bag inside the stuffing so she makes a nice sound) and squeeze his wings to hear him crinkle (a piece of a pretzel bag is sewn inside her wings!). A quick, easy project, this sweet butterfly comes together with just a few pretty scraps and some ribbon from your stash. Releasing this free pattern has caused me to reflect a little on what I’ve learned from these first three months of selling digital sewing patterns. 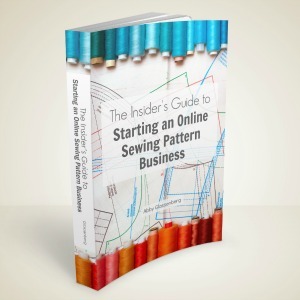 I began selling downloadable sewing patterns in March, both in my pattern shop on Craftsy and my shop on Etsy. 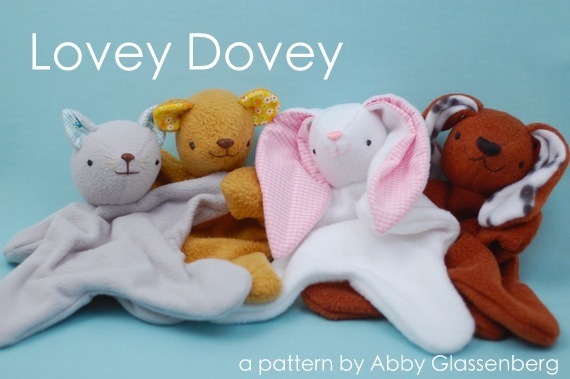 All of the patterns are $6.50 and allow you to sell the toys you make with credit to me as the designer. The patterns contain step-by-step photos, clear written instructions, and full-sized templates to easily download and print out again and again. The Craftsy patterns are an instant download and the Etsy patterns I email out within 24 hours, but usually very quickly. Patterns sell just about equally well on both platforms. The whole experience of selling digital patterns has been fantastic. After writing two books I feel very comfortable writing pattern instructions at a professional level and I am confident that I know what steps benefit most from a photo illustration. And most importantly I enjoy every part of the process of creating new patterns. The best part of selling digital downloads, though, has been the feedback from watching what sells best. Looking at the sales numbers on a per pattern basis is incredibly informative. 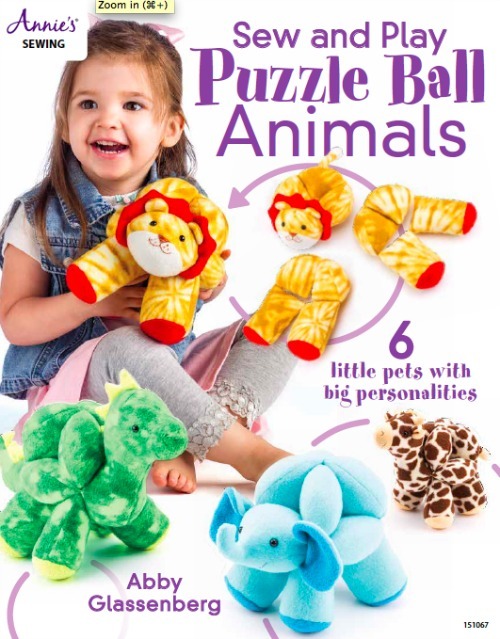 The biggest takeaway has been that patterns for baby toys are very popular. It would have taken me a long time to figure this out on my own without hard data to back it up. I love to sew baby gifts and clearly I’m not alone in this. I still think patterns bundled together in a book offer value in providing a body of work that builds on itself over the course of a longer text, but these unbundled patterns allow me to release new designs much more quickly and to get immediate feedback in terms of sales numbers which is incredibly valuable. A few months ago I talked about how I signed a licensing contract with Simplicity to design toys for their crafts division. 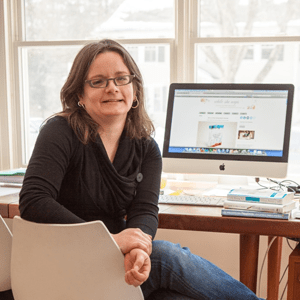 A few weeks ago I gave the Design Director at Simplicity access to all nine patterns so that she could choose three for their spring 2013 catalogue. 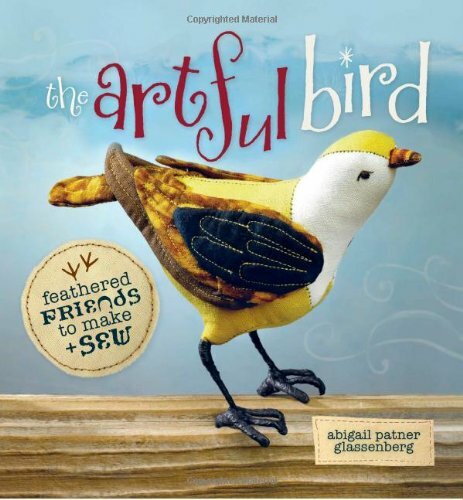 (One of the great thing about the licensing arrangement is that I can still sell the patterns individually online.) Without knowing anything about the sales numbers, she chose these same three patterns! Fascinating. Clearly these toys have broad appeal and I can see why. They are clever, cute, and not too intimidating. 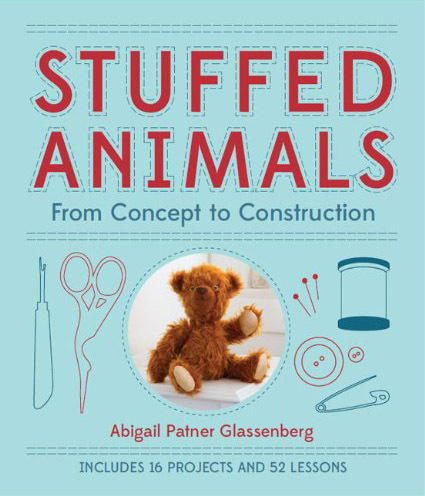 If you sew one and bring it to a baby shower, people are going to be impressed and you’re going to feel great that you gave a unique, handmade gift. I’m right there with you! The struggle, of course, is to allow the numbers to inform what I design next without letting sales statistics choose my creative path. I have to love what I’m working on in order for the design work to be successful AND I want to produce patterns that will sell well. So now the challenge is to create new patterns that fit both bills. While I love the chick and the blankie toys the one I bought was the caterpillar/butterfly. I love that one and it is a great pattern to read through. I am yet to make it but I really found the pattern easy to follow as I read through it. Wow, only 3 months? You are inspiring! That’s great that you can still sell the patterns you are licensing. Did you ask the Design Director at Simplicity why she chose those 3? What is it that she sees in them that makes her feel they will sell well? It’s true that it’s hard to recreate that “thing” that makes a pattern a star. I guess we will get a knack for finding the sweet spot over time! 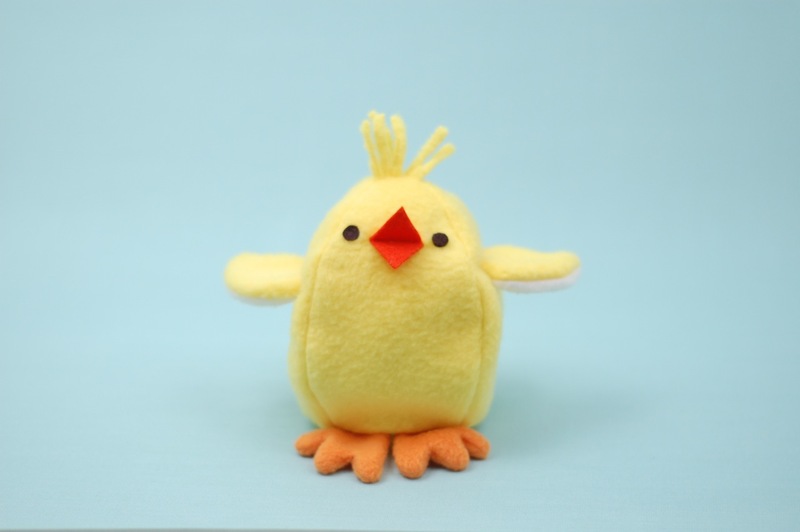 She said sewing projects for babies have been selling really well and she thought the chick and egg was clever. It's great to get her professional feedback! I love the butterfly! I may have to make one for the new baby. Just a caution on the blankie with the loops. I’ve heard that a company owns the trademark on all “taggie” blankets with ribbon loops, no matter the size. They won’t enforce it if the loop is cut. They go after independent sellers, and may not like patterns, either. Really. Where did you here that? Now that I’m looking around, though, it looks like the company was purchased in summer 2011 and may not be pursuing the same legal path – their language on their own website has been taken down (they used to offer to donate products to charity if you turned someone in for violating the copyright). Thanks for sharing this. I was wondering about how to track stuff like that. I’m getting closer to setting up a softie shop online and I’m loving all the info you’re sharing. Helps me to think outside of the box. Thank you for this link. It is something I'll investigate further, but I think you are correct that the company is no longer pursuing this path. These posts are all several years old and I know there are many Etsy sellers who make and sell items with ribbon loops without incident. 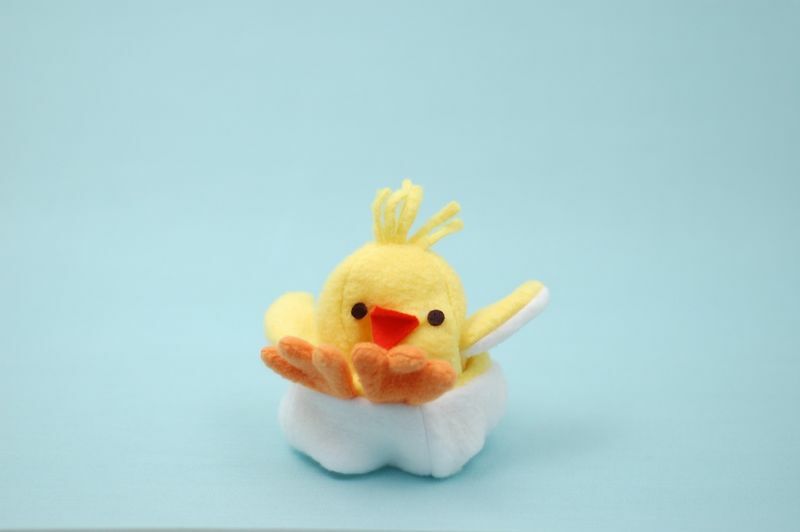 I am very happy you had that over there because I had not run across your patterns or blog before now which is strange because I am always doing searches for baby things. I have a 9 month old Grandson and an almost 4 month old Granddaughter so I can use these very well. Thanks so much, Vicki! I'm so glad you came over for a visit! Abby, I’m loving all your new patterns. They are so clever and well-done. And this butterfly is so adorable. And as always I appreciate your insight into the business end! 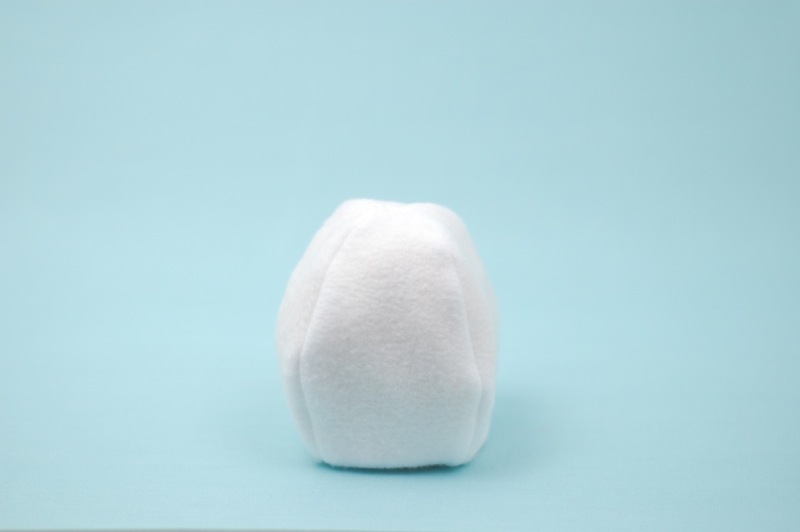 When I saw your pattern with the tag blankie it reminded me of the run-in Holly Keller had with the taggie company, who went after her etsy shop when she started selling taggie toys. It was a ridiculous notion to think they had rights over anything with ribbon tags on them. I’m glad they are no longer pursuing that. I didn't know about that incident. I'm researching to figure out if indeed there is an issue. To me it doesn't seem like there should be, but it is something I take seriously. Do you have a link to any information about her particular case? I always love your toy patterns, particularly the caterpillar that turns into a butterfly. One day I’ll have to buy it and make it. At the moment I have too many toy making ‘kits’ to try out, but I’m a little scared I’ll mess them up, as I’m quite new to sewing on a machine! All of the toys I’ve made so far have been hand sewn. 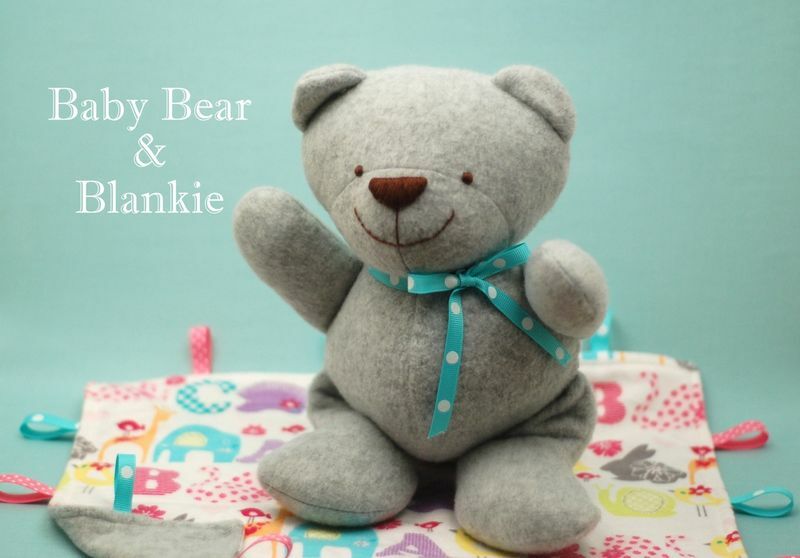 I love your blog too and want to thank you for all your brilliant advise on making and designing soft toys. It’s been a big help. Looking forward to your next book and definitely planning on buying it! That's so nice to hear, Vicky! Thank you. Hi Abby! May I just say, as an aspiring toymaker, following and learning from your design process has been SUCH an inspiration. (I have your toy design series bookmarked, and go back to it often.) Congratulations on all you’ve accomplished so far, and I can’t wait for your book to come out! Thank you so much, Stephanie! That is wonderful to hear! Hello Abby, I have just found your Stroller Butterfly and, as a newly-minted Grandma, I plan to take a stab at making one for our grandson. I wondered if the crinkle piece could be stitched in right along with the seaming and then turned inside-out with success? Have you tried that method? If so, did it work…or not? I plan to embroider the details to make it extra-washable. Thanks for any insight you may be able to offer. Congratulations to you. Yes, I think that method would work perfectly! Go for it!